In recent years, self-driving vehicles have become a popular discussion topic. Sandvik has had automated loaders and trucks working in mines for over 20 years – with zero accidents involving people. To prove its capabilities, Sandvik moved things above ground and put its latest generation of automation to the test. In a new film, an 11 m long Sandvik LH514 self-navigates through a labyrinth of glass. While glass is clearly a different material to the rock walls the laser sensors are designed for, the loader detects the fragile labyrinth and maneuvers through its narrow aisles. To prove the feat’s realness, Sandvik Group CEO Björn Rosengren takes over the driving at the end of the film and crashes into the glass labyrinth. For Rosengren, the glass labyrinth test was obviously a special day at work. The unique filmed feat also demonstrates Sandvik’s view on innovation. While a glass labyrinth might not be a traditional operating environment for a mining loader, such unconventional thinking has seen Sandvik stay at the forefront of technologies like automation. The AutoMine® system means that Sandvik loaders and trucks learn the safest and most efficient route the first time they enter a tunnel. Guided by a set of lasers, the equipment’s intelligent system maps out and records a path. 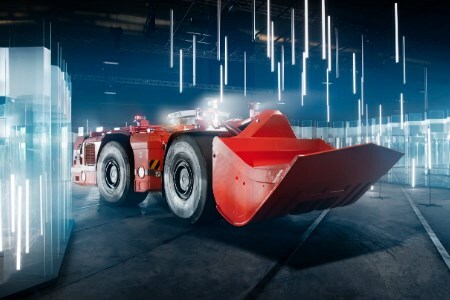 Sandvik’s patented algorithms, together with its sensors and gyroscopes, ensure the machine knows where to go underground, where GPS is not possible.